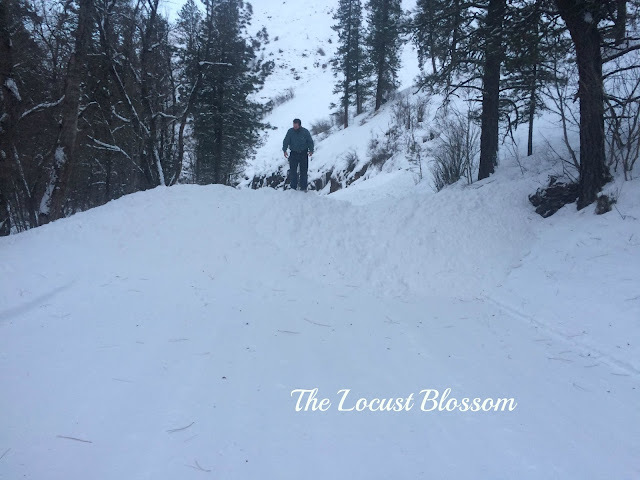 The Locust Blossom: Anyone up for an Avalanche? Anyone up for an Avalanche? Oh my, it's been a crazy week! Monday being a holiday, I didn't have to go to work. Tuesday morning, we awoke and got ready just like any 'normal' day. Mr. LB typically leaves about an hour before me. He left and was right back. He asked that I contact his boss and let him know that he would be late. There was an avalanche right at the end of our property. so that a rig could get through. We said our morning good-by's for a second time. By this time it was almost time for me to go so I went out to start the bronco. when in walks Mr. LB with the keys to my rig. He handed them to me and said, "We're not going anywhere." 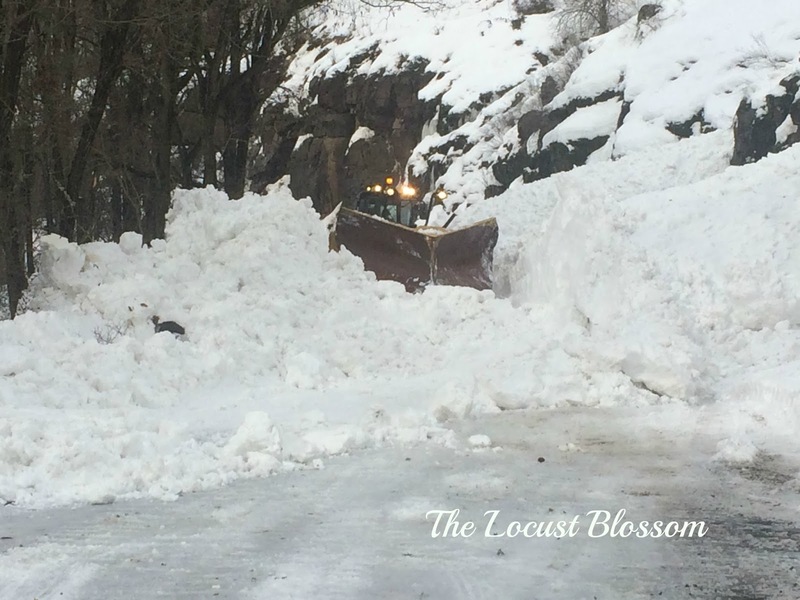 The avalanche he dug through was just a little teaser. Mr. LB standing on the first one we came to. From on top of the first one looking down the "road." We also called our employers to let them know we wouldn't be in. Then we went to take a look. Many more slid in the time they were up here. 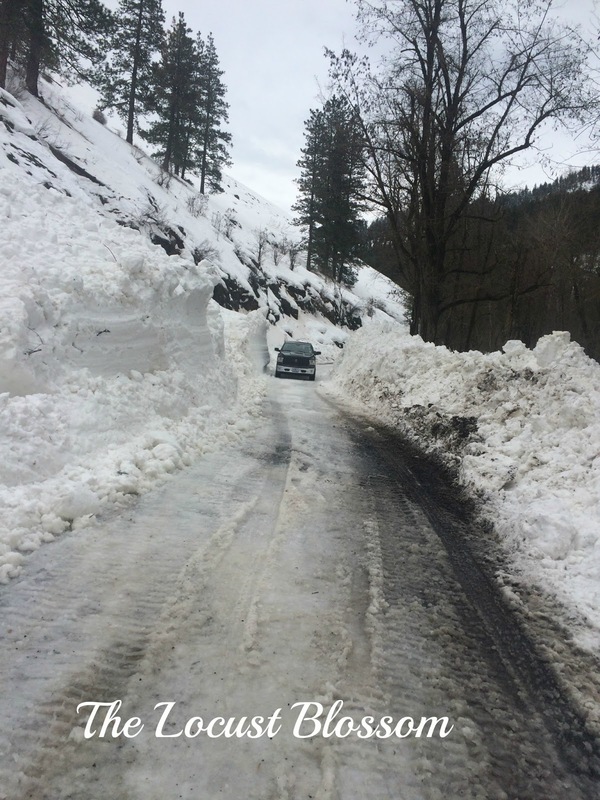 By the end of the day, they had the road "passable." So again on Tuesday, we were stuck. They broke through it just before noon. It was at least 14 ft. high. Just being on the road to get the picture was eery. As they were breaking through. We later discovered there were a couple more the other side of this one. We just couldn't see them. other than not being able to go to work, we were just fine. that we had plenty to eat, kept the fire going, and were safe. We aren't "preppers" by any means. But we do live in a more traditional way. we would eventually have run out of milk and cheese. Our meals might have become increasingly "boring," but we would still eat. For us, living where we live, living the way we live is important. perhaps it doesn't make much sense. But being "trapped" is an odd feeling. 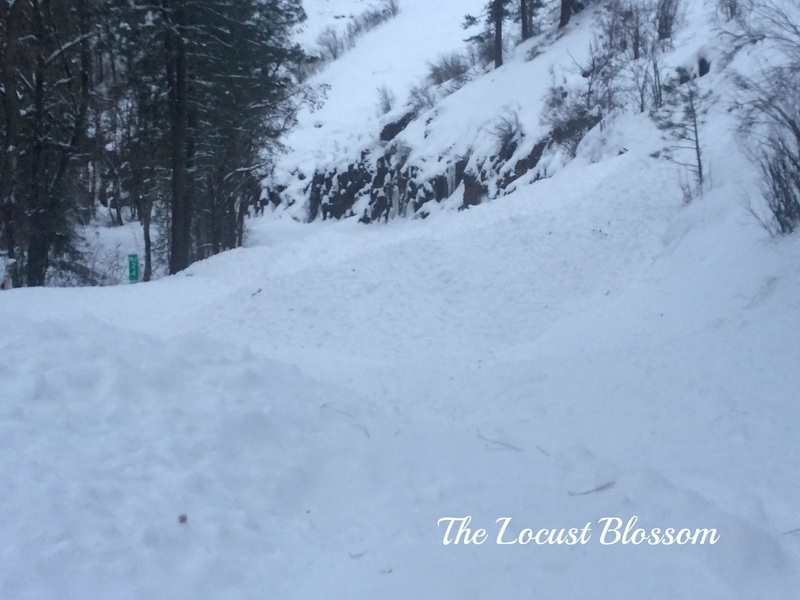 The evening of the larger avalanche was a neighbor's birthday. above the snow were able to attend. we had there to eat, and the company of neighbors. Two days later they spent the entire day on our road. but we can pass through pretty easily. Sometimes, the wisest thing to do is simply stay put, eat stew, and be safe. Sometimes,I'm thankful for our West Virginia hills. We may have snow drifts, but no avalanches. Yes indeed - be safe! That looks really scary and good thing you weren't on the road when it happened. I am thankful nobody was swept away. I know a fella that was trapped in his car for over an hour in an avalanche. Terrifying. Glad you are safe. It sounds like "staying put" was the best decision! Thanks for stopping by Colletta's Kitchen Sink! Wow that was a lot of snow! I love your blog, Wendy (aka Emeline). Have a great day.